INDIANAPOLIS – The National Panhellenic Conference (NPC), one of the largest advocacy and support organizations for women, today announced the launch of a new educational program for sorority women. Be Bold is an interactive video series offering women the opportunity to explore critical topics affecting their lives and empowering them to be their best, most authentic selves. NPC partnered with Erin Fischer, owner and CEO of The Leadership and Training Studio, to create the Be Bold program that includes seven self-paced videos featuring Fischer as well as facilitator and participant guides. The activities and people that make you feel confident. Shining the light on other women. Under, over and authentic confidence. Imposter phenomenon and effortless perfectionism. 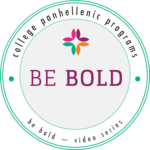 Jones noted while Be Bold was originally developed for college-age sorority women, all women can benefit from the lessons in the videos. Be Bold can be presented in a large group setting or can be adjusted to fit the needs of a small group or an individual. Program materials for Be Bold can be downloaded from the NPC website: Be Bold. NPC, one of the largest organizations advocating for women, is the umbrella group for 26 national and international sororities. NPC sororities are located on more than 670 campuses with 418,000 undergraduate members in 3,347 chapters. Alumnae are represented in 3,754 associations throughout the world. For more information, including a complete list of NPC sororities, visit npcwomen.org or find NPC on Twitter, Instagram and Facebook.